While some Lego Serious Play kits are out of stock, let me give you my approach that I used a few months ago (DIY, do-it-yourself approach). I visited our local LEGO reseller and created the kits with their help. To help you I have added here below a step-by-step guide on how you could do the same with links to Amazon.com website, where today all the items seem to be in stock. If you have any questions about the set then I would be more than happy to comment. Furthermore I know that many of us have used customised sets. If you have some good experience with some of the sets then you are more than welcome to share your examples, too. This step-by-step guide will help you to create a set that would be appropriate for a group of 10-15 people. See below for the detailed description. I needed to divide people to groups, but in order to make sure that the bricks would be easily handled I first ordered sets of LEGO Education Storage Bins (measurements: 26*42*31cm / 12″x16.5″x10″). Even if you have the original LSP products at hand, I would suggest to use them because of their convenience during transport and handling the bricks between the tables. Please note that if you plan to order these blue boxes through Amazon.com they sell the boxes by default in sets of six boxes. Your local LEGO reseller might sell you them also one by one. But you may also skip purchase of the Storage Bins. There is a nice alternative. Some Lego Education sets already come either inside high or low Storage Bins, as you can see on the picture of this product. The smaller version of Storage Bin is ca 10cm (4″) lower. There are some Lego Education special sets which come in the lower version (e.g. 9311L – Lego Education City Buildings Set, 9333L – Lego Education Vehicles Set or 9335L – Lego Education Space & Airport Set), which you might find very useful depending on your topics of facilitation. However – bear in mind that all those lower Lego Education sets have been packaged rather full of bricks and you will not be able to add to those boxes much additional pieces as I suggest below. For in-house facilitation sessions you might also consider Lego Drawer sets, which allow you to divide similar types of bricks into different slots for easier handling. This set also has a 26 cm (10″) base plate and a few small base plates included. Bear in mind that this drawer solution is only appropriate for the small bricks. Larger Duplo bricks don’t fit well. Furthermore – it is not suitable if you need to travel with your bricks as the drawers cannot be closed and fixed properly. While the Storage Boxes close with a solid ‘click’ and once they are in place then they can fall and nothing would happen to them – when you tilt the Drawer set even slightly – you are likely spending the next few minutes collecting the bricks. Both Landscape Kit and Connection kit come with handy sorting trays. Lego does not offer anything similar, but you may take a look at some of the options by the other producers. 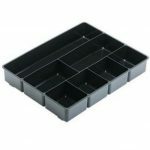 For instance, Rubbermaid’s drawer tray, allows dividing easily similar types of bricks into sections so that the builders would have an easy access to the types of stuff they need. 3-4 sorting trays are quite enough to compartmentalise them nicely. After the storage solution was ordered I identified suitable base plates. There are two main options – depending on whether you are primarily using large Duplo bricks or small Lego bricks. Duplo has a large base plate (2304L – square 38cm (15″)) that you might consider. However, in my experience I have not found much use for large Duplo base plates. Frequently when the participants of the LSP sessions use Duplo bricks to build something standalone, they place those on top of the other plates and ignore the Duplo base plate. It is up to you to decide if they come handy or not. However, those who build with smaller bricks usually prefer to attach them to base plates. Hence I found it the most practical to choose a single large building plate with small studs for each table. I opted for larger 628L 38cm (15″) base plates with small studs, but depending on the size of your tables you can also go for slightly smaller 626L 26cm (10″) option. Please bear in mind that the 26cm (10″) base plates would just about fit into your Storage Box, but the larger 38cm (15″) you will have to handle separately. If you would like to purchase more than one base plate then it might be a good idea to save on that and purchase a Set of Large Building Plates that includes three 26cm (10″) base plates and a single 38cm (15″) version in different colours, which would allow you to differentiate between nature, grass and forest (green), water and interiors (blue) and generic streetscapes (gray). After having chosen the large base plates I also decided to get a handful of small base plates for individual builders, who find it usually handy to start off with their building on their small base plate before they connect their buildings with the group. There is a 9388L package containing 22 base plates, which is pretty enough for a group of 10 people. You may check how many small base plates come with the other sets. If your group will be larger then you might want to purchase another one of these. After the storage and base plates are in place we will get into the more difficult stage – compiling the actual Lego parts for building. What we have to first keep in mind is the high diversity of items of the LSP kits. The Landscape Kit comes with more than 2750 components and Communications Kit with more than 2000. Combined number of different parts provides a rich toolkit that not a single other Lego set is able to match. In order to have a vivid and imaginative discussion with your participants, it is necessary to combine a number of different kits into one. Lego Educational has a number rather elaborate community sets that provide nearly as good match for the LSP Kits, but require some creativity to combine. The most elaborate of those to start with is 9389L – LEGO Educational Community Starter Set, which comes with its own large storage box. It consists of 1907 components – a large number of simple building blocks, mini-figures and special items. This set provides a rather appropriate starting point for most building activities that your group might be tasked with. However, even though the number of different items included in the first community starter set might sound already ca 1/3 of the Landscape and Identity Kit, this is still not nearly enough for meaningful building for a group of 10 people. I first have decided to add some items that make building activity easier. For this some additional Lego Education community sets come in handy. My own favourite is a Educational Scenery Set Box no.9385L with 1207 parts that have both ordinary bricks as well as some interesting items, e.g. flowers, snakes, chicken for different metaphors. This box also contains a number of colourful small flags that I normally remove from the sets. They give me the possibility to walk around as a facilitator in the room and mark some important items on the buildings of the participants to discuss their details. Alternatively – if you don’t need these special items that I pointed out – then just a more economical Community Educational Brick Set box no.9384L of 884 ordinary bricks for you to consider. For simple building tasks would be sufficient. 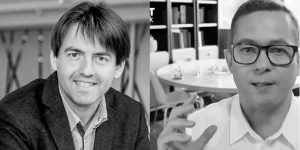 While people with less out-of-box creativity prefer to use interesting items, I have witnessed that when I work with more creative people then even they prefer to use simple building blocks that allow more flexibility to build and express the abstract concepts that they want to get across. Thereafter I purchased some additional mini-figures. Frequently each participant wants to use ca 4-5 people-figures. While you could easily purchase a number of individual mini-figures that Lego has produced, it would become very expensive very soon as the individual mini-figures usually cost ca 7-8 EUR each. It would greatly make sense to purchase sets. 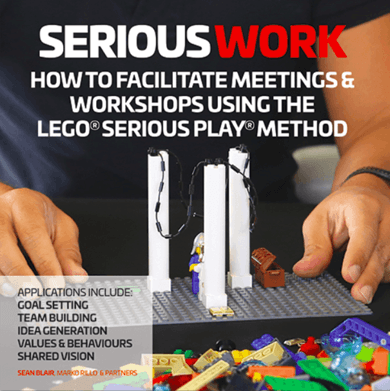 I decided to go for one of the both packages below for each tables, but depending on your focus on people-issues during facilitation session, you might even want to take two packages of the both mini-figure sets for a group of 10. The first interesting set of mini-figures is 9348L has got 22 Community Minifigures (e.g. employees, sportsmen, children and cleaners). This is obviously useful in case you want the participants to discuss their customers – ordinary people from the street or the employees in their organisation. However, another interesting set gives the opportunity to discuss more emotional issues. While the LSP Identity and Landscape Kit comes really with a large pile of “skeletons in the closet”. There is one mini-figures set in the Lego Education collection which helps to provide the same messages across. 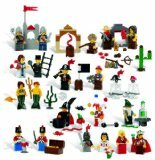 9349L has got 22 Fairytale and Historic Minifigures, which includes jesters, kings, princesses soldiers, skeletons. These minifigures could be used to describe business threats, competitors or in some cases also difficult co-workers in their own organisations. Some participants at the facilitation sessions enjoy “driving their issues around” on the table of metaphors to get their messages across more easily. For their purpose I have specifically added one box of Vehicles and Wheels Set (9387L), which are appropriate to discuss dynamic topics.These are also very good set if you plan to use the famous “Go-kart Creativity Task,” as an ice-breaker in which you task your participants to design various models of go-karts to compete in their approach. There are some additional items that might come handy to your boxes. Lego Creepy Crawlers with snakes, spiders and scorpions is an interesting tiny set that is helpful for describing the business threats or everyday problems that people tend to have. and Lego Duplo Wild Animals set with lions, elephants, monkeys and alligators helps to easily describe in a colourful manner different stakeholders, clients or competitors that your group members come across on an everyday basis. Believe it or not – that was it! :-) Usually the large Storage Box above would be just about sufficient to fit all of the items for a single table of ca 10-12 participants and you are most likely ready to go. While your storage box might be already full containing all the items from above – in some cases, if I would have had to work more with metaphors then I would have contemplated also purchasing the following sets that allow to put some additional animals to the tables. E.g. Lego Duplo Large Zoo is more elaborate, but large enough for at least 20 people to use for additional stakeholder work. However, bear in mind that this comes in a large carton box and you will probably need a separate Storage Box to put them in. Alternatively, 6141 – Lego Duplo First Farm is smaller and just enough for the group of 10. It comes with a number of Duplo building blocks and also has some animals that might be also good for your metaphors work – cows, chicken.